Popular places to ride bicycles such as parks and recreational areas are also popular among dog owners. It only takes a moment for a dog to dart out in front of a bicyclist-- either hitting the bicycle or causing the cyclist to react quickly and lose control of the bike, potentially causing a serious injury accident. 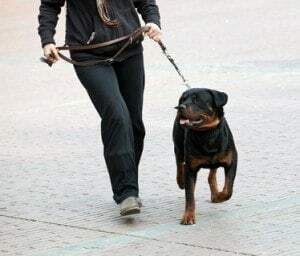 Although neither the dog or the dog’s owner may have been maliciously meaning to harm, it is the owner’s responsibility to control their dog to prevent injuries and accidents to others. In many cases, the dog owner may be held liable for the injuries that occur when their dog causes a cycling accident. Rosenfeld Injury Lawyers LLC has represented bicyclists and motorcyclists injured in accidents when they are attacked by a dog. Even if there was not physical contact, you may be able to pursue a legal claim against the owner of the animal under Illinois law. Talk to our lawyers today for a free review of your bike accident caused by an attacking dog. Under Illinois Municipal Code, dog owners are liable for any injuries that are caused by their dog. This is usually due to a dog attack on a peaceful person or animals owned by other persons. However, the law also states that the owner is responsible when a dog injures another person that is “…peaceably conducting himself or herself in any place where he or she may lawfully be..” This can apply in a case of a dog versus bike accident when the cyclist is injured while lawfully riding their bike. In addition, in the city of Chicago and many other Illinois towns, ordinances require that all dogs be confined by owners, either in their home, yard, crate, vehicle or on a leash. Most dogs that would cause a bike accident would be unrestrained; thus the owner would be in violation of this law as well. Both the Illinois and city laws can be useful in proving liability in a dog versus bike injury accident. When an owner of a dog is sued for injuries, whether it is for a dog attack or an accident such as a dog versus bike incident, often it is their homeowners insurance policy that covers the damages. Most homeowners insurance covers not only the home, it also covers liability when another person is injured on the property or when another person is injured by a pet owned by the homeowner. This generally covers injuries that happen away from the home as well. In dog versus bike accidents, if the owner is found liable for not restraining their dog, the bicyclist may be able to obtain damages for their injuries. This can include medical bills, lost wages, therapy and other expenses. If the dog owner has homeowners insurance, the injured bicyclists can file a claim against the insurance carrier. Otherwise, it may be necessary to file a lawsuit against the dog owner for damages. Whenever a bicyclist is injured due to an accident caused by a dog, they should seek legal advice on the best way to ensure their medical bills and other expenses are covered. Although the dog owner’s homeowners insurance may cover damages caused by their dog, the insurance company most likely will want to pay out as little as possible or claim that the dog owner was not at fault and pay out nothing at all. Having an experienced Chicago bike accident attorney on your side that understands the liability laws regarding dog ownership can make a large difference in the outcome of your claim.